Attending a dinner party and forgot to get your cocktail loving host/hostess a gift? Instead of rushing to the wine shop and getting the usual, impress them with something homemade! 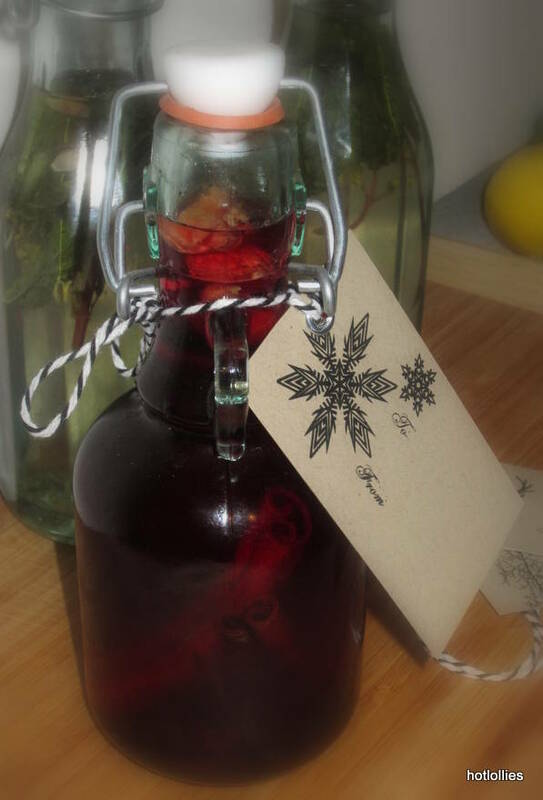 This hibiscus and ginger simple syrup will add a nice personal touch and will only take minutes to make! All you need is a pretty bottle and nice ribbon, labels or tags. I’m sure the cocktail enthusiasts and non-drinkers alike would be pleased knowing you took the time to make them something special. This hibiscus and ginger simple syrup can be used to make hibiscus mojitos, or mixed with vodka and seltzer for a cocktail spritzer or added to sweeten your lemonade or ice tea. The recipe ideas are endless! 1. Dissolve sugar and water in a saucepan over medium heat. Keep stirring until liquid turns clear as water. 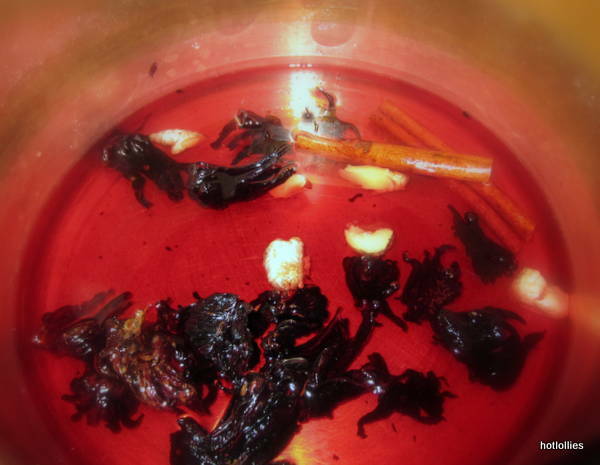 Add the hibiscus, ginger and cinnamon stick and let mixture simmer for about 2 minutes. Do not allow mixture to boil. Remove from heat and let syrup cool down completely. 2. Wash and dry two 8 oz bottle or a few smaller size bottles. 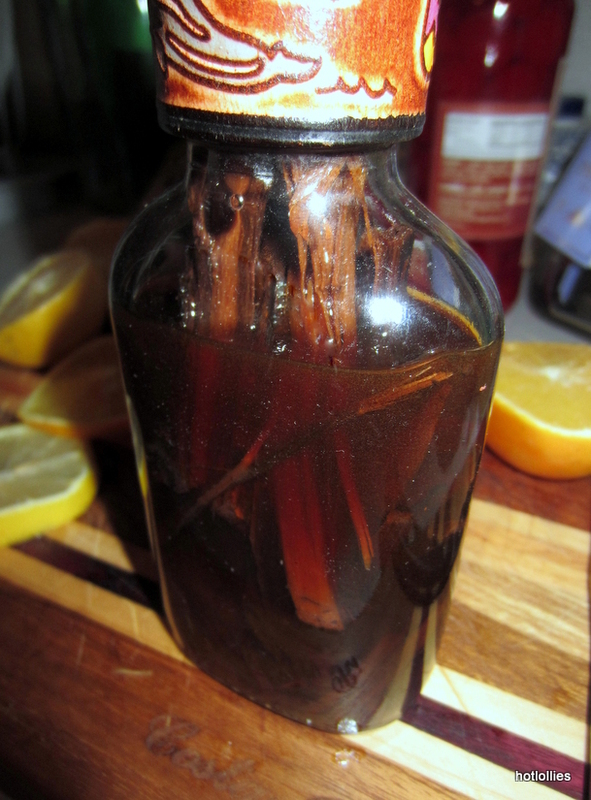 Add a couple of ginger pieces and cinnamon sticks from mixture into each bottle and pour in the cool syrup. Decorate bottles as you like. Here are a few more simple syrup flavors you can make! 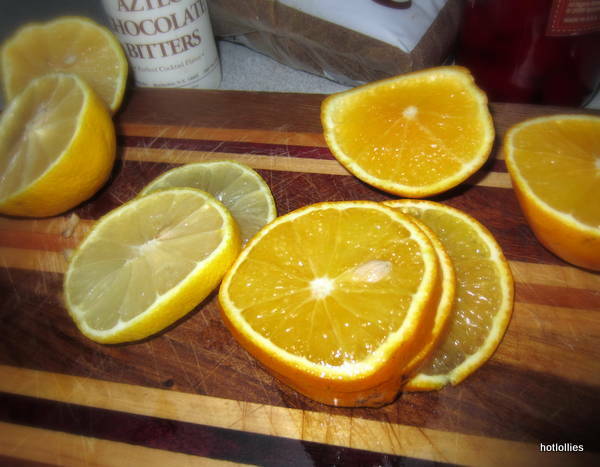 Add a bunch of mint leaves, juice of a lemon and lemon rind to the syrup. Add a bunch of Thai basil and a Thai chili to the syrup. Add 1/4 cup of mashed raspberry to syrup with a 1/2 jalapeno sliced. You can strain the syrup to remove the raspberry seeds but add the jalapenos back and into bottles. Still looking for gifts for that spicy food lover in your life? Etsy is a wonderful marketplace for finding handmade and vintage gift items. I perused the site for cool gift ideas for the spicy food lover and picked a handful that I thought you would enjoy unwrapping! 1. 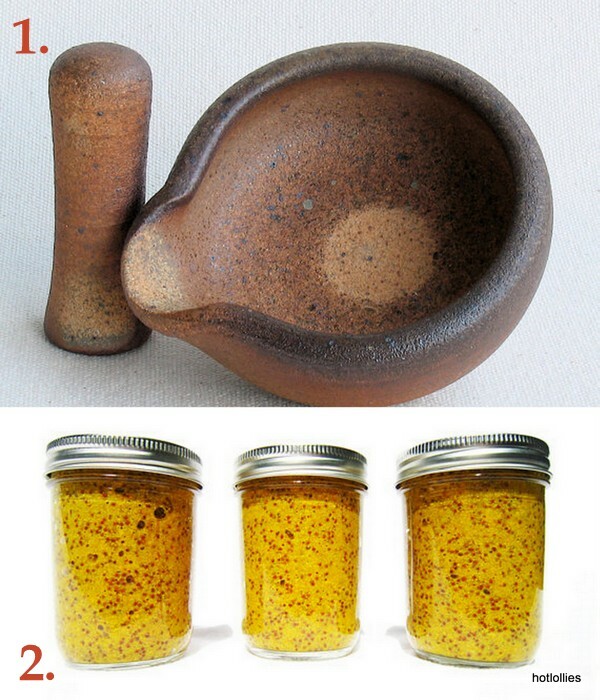 This Mortar and Pestle is perfect for grinding spices and chile peppers. It’s a must in every foodie’s kitchen! This one is handmade and one of a kind from the Mary Carol Perez shop. 2. How about spicy hot mustard to slather on warm pretzels? This hot little number has one of the hottest peppers in the world and surely a little will go a long way. Spicy ghost pepper mustard from Evolutionary Farms. 3. Spicy chocolate sweets are always a nice little treats. Get these Chile cake ball sampler from Cake Works by Jen or some of her other spiced cake balls. 4. These letterpress cards are so sweet! 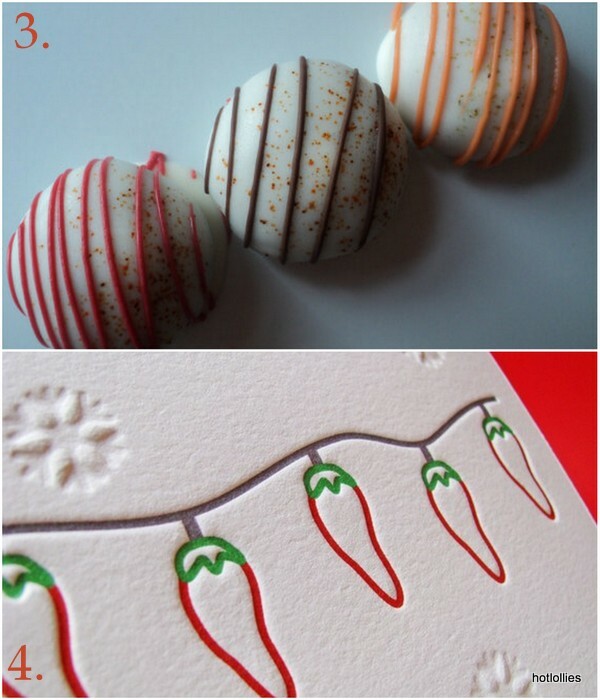 Chile lights Christmas card from Letterpress Light. 5. 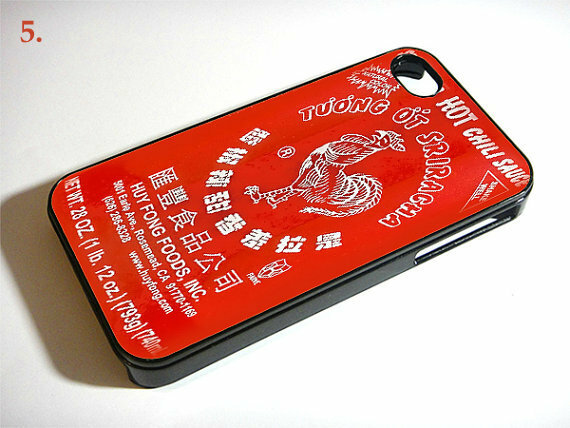 Now for the real Sriracha fans, how about this Sriracha iPhone case from Expresso Print? Well happy shopping! If you can’t find that perfect gift then give the gift of time! Time spent with friend and family enjoying a nice home cooked meal is sometimes all you need! Hope you all have a happy holiday!! During the winter months I like switching to cocktails made with dark or amber liquors. Vodka or tequila are normally my spirits of choice but when its cold out and nice and cozy inside, all I want to sip on is B&B, or a cocktail made with rum, bourbon or whiskey. The spices in these spirits are fitting for this time of year, especially a spiced rum blend native to the Dominican Republic, the Mamajuana. Mamajuana is dark rum infused with roots, tree bark, spices and is a staple in almost every Dominican home. It’s early uses were for medicinal purposes, curing everything from a cold, fever, stomach aches, you name it…well at least that’s what my parents would say, and still do. My theory is the rum just made most folks drunk enough to forget they had an ailment, just don’t tell my Dad that, he still believes a shot of Mamajuana, with a little honey and lemon will put some doctors out of business. Although I have to be honest, I have seen its powers…powers that make you feel niiiice! I don’t know exactly what goes into making it but bottles are kept in families for decades and just refreshed with new roots, raisins, honey and sometimes a piece of beef! Really, don’t ask. I also heard some natural “aphrodisiacs” were added so it’s a rum that should definitely be consumed in moderation and it could have strange effects to the uninitiated. Mamajuana is also a liquor with complex flavors. It’s a strong and smooth rum with a bite and a hint of sweetness that will make you reach for a little more. It heats up nicely as it goes down and perfect for frigid days. Beware though, not all bottles are the same. I’ve sampled many bottles over the years and one thing it shouldn’t be is too sweet or taste like wine. 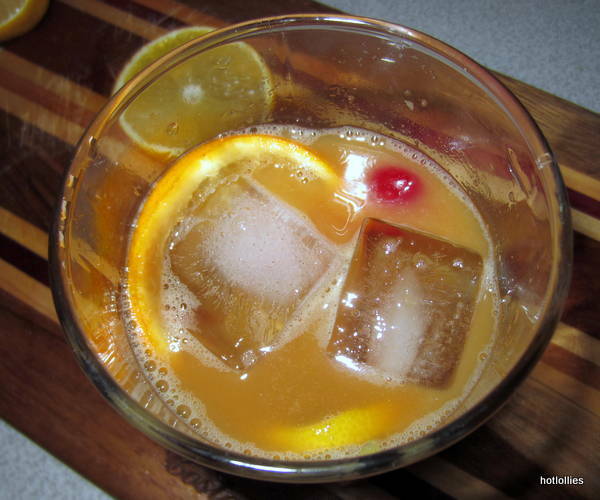 Mamajuana can be enjoyed neat, on the rocks or mixed with cola, gingerale, and orange juice. However I wanted to make something special for the holidays. 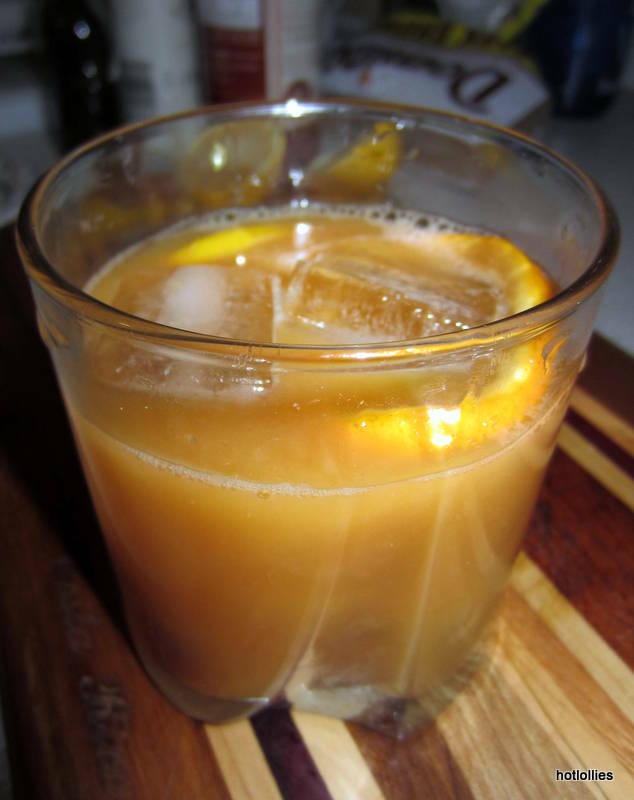 I had chocolate bitters on hand that I hadn’t used yet so thought I’d make something similar to a traditional American cocktail, the Old Fashioned. The citrus flavors and chocolate bitters went very well with the rum and a new cocktail was born, the Spiced Citrus Mamajuana cocktail. I muddled lemon and orange slices with brown sugar, bitters and cayenne pepper for a nice kick. It’s a cocktail you must try and great for your holiday party! 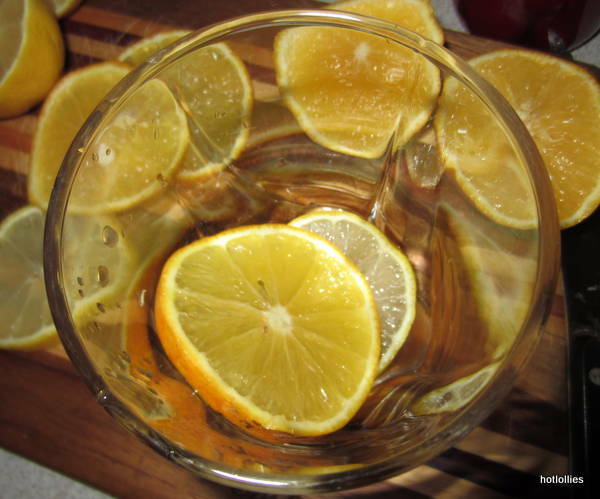 Add sugar, dashes of bitters, cayenne pepper, orange and lemon slices to a glass and muddle all with a wooden spoon until well mixed. 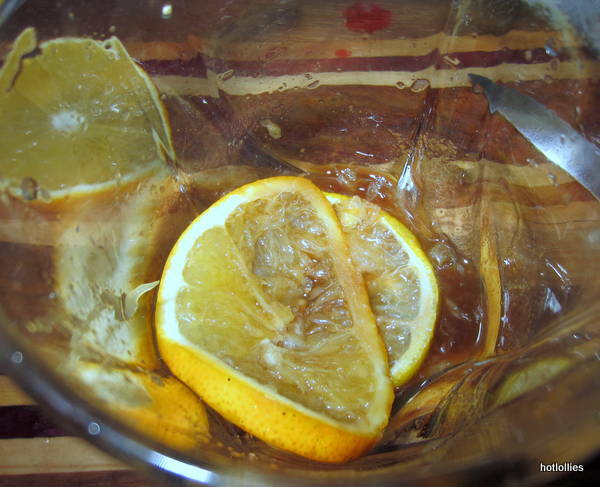 Add ice cubes and pour in Mamajuana rum, then orange juice and stir. Top with a cherry! 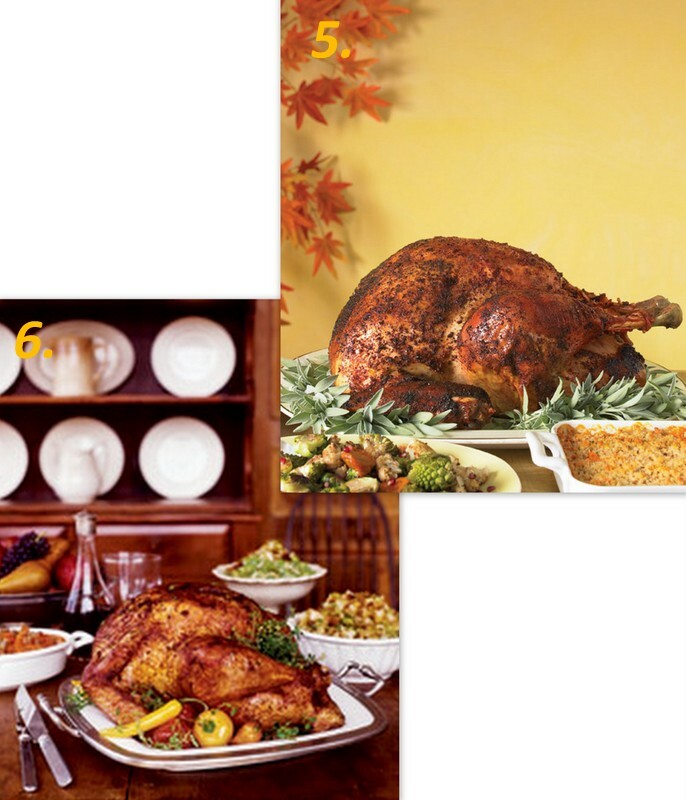 Have you decided on how you’re going to make your turkey for Thanksgiving? You might already have your tried and true recipe that’s been in the family for years but if you want to try something different check out these spicy turkey recipes! I love a flavorful and juicy turkey and these recipes will be sure to add some zest to that old and boring turkey recipe. From fried creole turkey to an ancho chile rubbed turkey, these kicked up recipes will be a huge hit at your Thanksgiving dinner. How will you season your turkey? 1. Creole Deep Fried Turkey from Southern Living, photo credit: Lain Bagwell, styling: Lydia Degaris Purcell. 2. 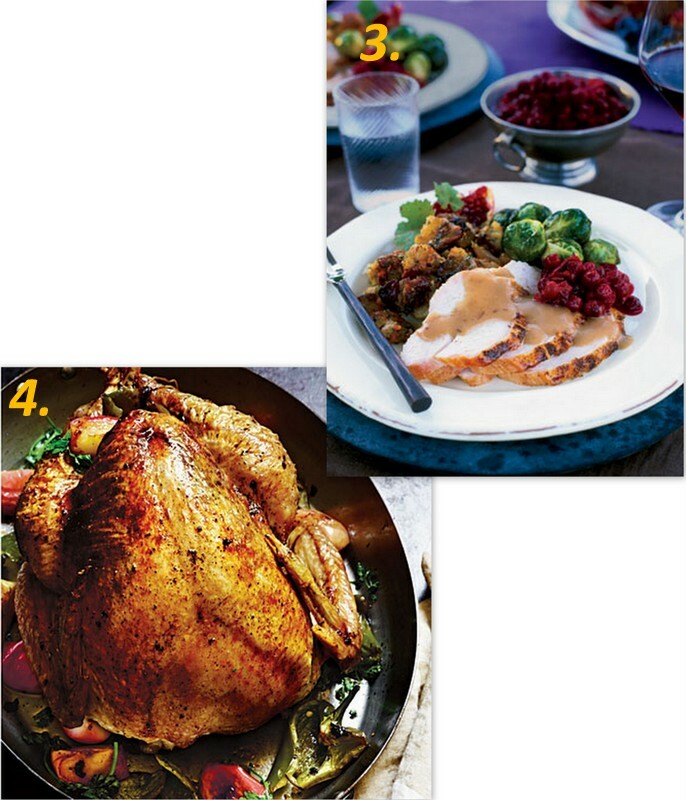 Chile-Rubbed Turkey with Beet Stuffing and Gravy from Saveur, photo credit: Todd Coleman. 3. 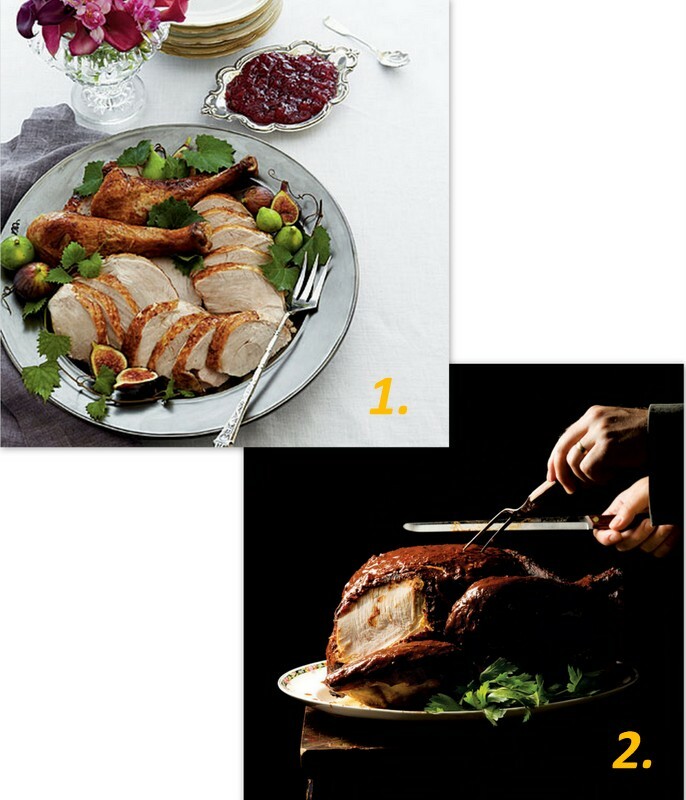 Spice-Rubbed Whole Roasted Turkey with Cranberry Gravy from Country Living, photo credit: Ray Kachatorian. 4. Apple Poblano Whole Roast Turkey from Cooking Light, photo credit: Oxmoor House. 5. Spice Rubbed Roast Turkey from Martha Stewart. 6. Paprika Glazed Turkey with Pumpkin Seed Bread Salad from Food and Wine, photo credit: Frances Janisch.